Soulcaster is, in as few words as possible, tower defense mixed with dungeon crawling. You have a top-down view of a battlefield and the ability to summon three different warriors. Instead of the normal gameplay of making sure your enemy doesn't reach a certain goal, you're an old wizard who walks around the field summoning these warriors and making sure you don't die. You have a knight, an archer, and an alchemist (in this case, dude who essentially throws molotov cocktails), and can summon multiples of each one. You don't personally attack your foes outside of some limited-use scrolls that hit everything around you. Along the way you can upgrade your warriors and purchase the ability to summon more at a time (up to five). If any of your warriors die you can summon them again...but only after you wait a few scary seconds while your miniature army is weakened by its loss. Once you clear all your foes off the map (or, sometimes, before this) you're free to go to the next area. Let the old man die, you start the map over. The retro style graphics of Soulcaster are about as retro as you can get. The game looks like it came straight from the late NES/early Genesis days but, in all honesty, it fits the game so well I couldn't imagine it any other way. Everything about the style makes me feel like I'm playing a well-designed NES game. Some could see it as a cop out, and the developer admits one of the reasons for the style is because he's a programmer and musician first, but there's a nostalgic beauty in the pixelated simplicity presented here. Speaking of him being a musician, it shows. The soundtrack for the game is as amazing as it is fitting and makes me hope this guy is successful just so I can hear more songs by him in his games. The shopkeeper's song is the most epic 8-bit metal song EVER and yes, I'm kinda serious about that. Warrior placement, though simple and effective, oddly take a little bit to get used to. Pressing X, B, or A places the knight, alchemist or archer (respectively) and Y will unsummon the earliest placed one. I found myself pressing the wrong button a few times in the heat of battle. Not a fault of the programmer as much as an expectation of the genre since, when you play a dungeon crawler and see something, you have the gut instinct of mashing. After about five minutes of having all three warriors I felt pretty comfortable with putting the right one on the field while moving around trying to save my own skin. The only thing that slows the action down or puts you at risk is when you unsummon the wrong warrior, but you can alleviate this by thinking about the order you place your troops. Difficult to do when you're getting rushed down by zombies and reapers but hey, nothing worthwhile is overly easy. Though the game's retro style is awesome in nearly every way it admittedly made me cringe a little when I realized it had the one thing I don't miss about the good old days: passwords. I actually raised an eyebrow when I realized I'd have to get up and go get a pen and some paper so I could continue in the morning. Thankfully there aren't any numbers so I don't mix 0 and O or I, l and 1 up but I really don't see the need for this over a save system. Really, though, this is my only gripe with the game other than a desire for more. When the dust settles and you've restored peace to the land you'll have put about 90 minutes of gameplay in, give or take. Hard mode, which really is challenging and fun even if it is just the same thing but more difficult, might take an extra 30 or so at most. I didn't see any unlockables but since I died like 25 times between the two quests and didn't bother to go back through for a shorter time (yet) I could very well be wrong about that. Some of the XBLA and XBLIG games I delete after completing (very little free space) but the short time for a quest makes me want to leave this on there for when I have an hour or so to kill. I can't say that Soulcaster is the best tower defense game ever (since I shy away from the games on the whole) but it's probably the most interesting one I've seen and a very fresh take on the genre. What I can say, without question, is that it's one of the best games offered on XBLIG hands-down and definitely makes me excited for future entries from MagicalTimeBean. Any fans of either tower defense OR Gauntlet-style dungeon crawlers should go download the demo and then, very shortly after, download the full game. 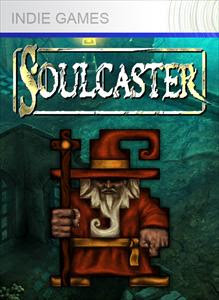 Soulcaster by MagicalTimeBean is available on XBox Live for 240 MS Points. I was given a copy of the game for review (many thanks, Ian!). Played both Normal and Hard mode to completion, screamed like a little girl with genuine dread the first time a black reaper tore through my soldiers like nothing, and found myself wanting arranged versions of the game's tunes.